Mixed martial arts is a mix of different styles of martial arts. UFC is a full-contact combat sport that allows both striking and grappling, both standing and on the ground, using techniques from other combat sports and martial arts. The first documented use of the term mixed martial arts was in a review of UFC 1 by television critic Howard Rosenberg in 1993. The term gained popularity when newfullcontact.com, then one of the largest websites covering the sport, hosted and republished the article. The question of who actually coined the term is subject to debate. Mixed martial arts (MMA) is a mix of different styles of martial arts. 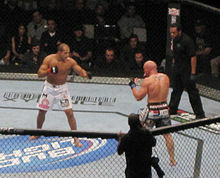 UFC is a full-contact combat sport that allows both striking and grappling, both standing and on the ground, using techniques from other combat sports and martial arts. The first documented use of the term mixed martial arts was in a review of UFC 1 by television critic Howard Rosenberg in 1993. The term gained popularity when newfullcontact.com, then one of the largest websites covering the sport, hosted and republished the article. The question of who actually coined the term is subject to debate.